When browsing the shelves of Toys-R-Us, it's easy to be distracted by the latest craze and "must-haves". While there are a great many modern toys on the market which offer good play value, there are some essential toy types which every well-stocked toy box should include. You'll find these in nurseries and playgroups across the country: the types of toys which are brought out again and again, and which are rarely relegated to the bottom of the toy box. What's more, these toys offer good educational value, and are relatively inexpensive. 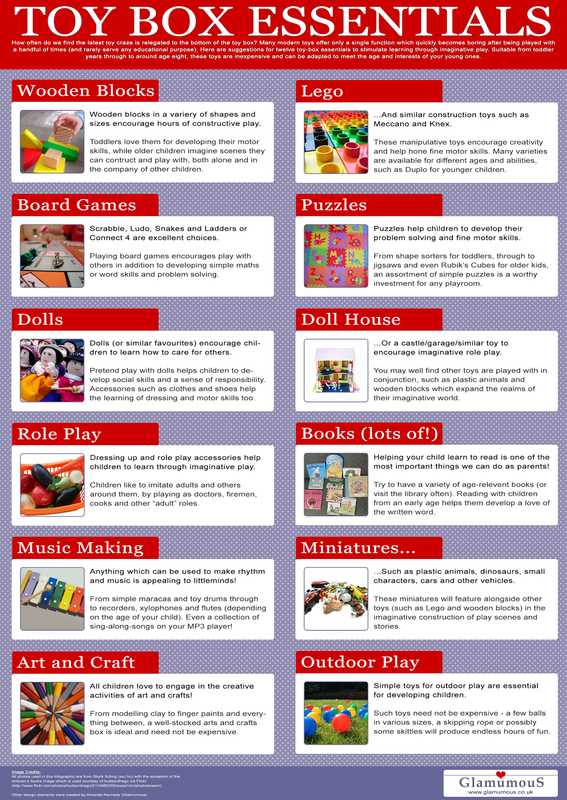 If you're stuck for ideas for what to buy your child for their next birthday, or are looking for gift ideas, check out this cheat sheet of play room essentials and find toys which will stand the test of time. This cheat sheet is A4 size for easy printing!